TONI&GUY.com offers a unique and exciting range of hair care products sourced from the best brands in the world. TONI&GUY offer an extensive range of shampoos, conditioners, brushes, combs, scissors, electrical items and accessories. The range of products available is the result of careful consideration and years of testing in their salons and in over twenty five TONI&GUY academies around the globe. TONI&GUY have remained at the forefront of the hairdressing industry and has pioneered the professional hairdresser. TONI&GUY launch a global trend collection every year. Pioneers in creating cutting edge hair products, the Company have created the award winning TONI&GUY range of haircare products. With new products launched regularly, this range is constantly growing and always talked about. 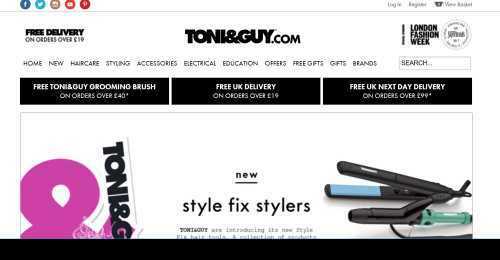 Free gift offers from TONI&GUY! TONI&GUY has a variety of offers that bring you free gifts. Have a closer look for yourself. Verified this month. Valid until further notice. TONI&GUY discount code not required.